WASHINGTON (AP) — Reversing his past calls for a speedy exit, President Donald Trump recommitted the United States to the 16-year-old war in Afghanistan Monday night, declaring U.S. troops must “fight to win.” He pointedly declined to disclose how many more troops will be dispatched to wage America’s longest war. In a prime-time address to unveil his new Afghanistan strategy, Trump said the U.S. would shift away from a “time-based” approach, instead linking its assistance to results and to cooperation from the beleaguered Afghan government, Pakistan and others. He insisted it would be a “regional” strategy that addressed the roles played by other South Asian nations — especially Pakistan’s harboring of elements of the Taliban. Although Trump insisted he would “not talk about numbers of troops” or telegraph military moves in advance, he hinted that he’d embraced the Pentagon’s proposal to boost troop numbers by nearly 4,000, augmenting the roughly 8,400 Americans there now. “We will ask our NATO allies and global partners to support our new strategy, with additional troop and funding increases in line with our own. We are confident they will,” Trump said in comments echoed by Defense Secretary Jim Mattis. Earlier this year, Trump announced he was entrusting Mattis and the military with the decision about how many troops would be needed. In talking points sent Monday to congressional Republicans and supportive groups, the White House affirmed that the troop numbers were up to Mattis and added that the administration wasn’t seeking more money from Congress for the strategy in the current fiscal year, which concludes at the end of next month. While Trump stressed his strategy was about more than just the military, he was vague on other “instruments of American power” he said would be deployed in full force to lead Afghanistan toward peace, such as economic development or new engagement with Pakistan and India. Absent military specifics, it was difficult to assess how his plan might dissolve the stalemate between the Taliban and the Afghan government. On one point — the definition of victory — Trump was unequivocal. He said American troops would “fight to win” by attacking enemies, “crushing” al-Qaida, preventing terror attacks against Americans and “obliterating” the Islamic State group, whose affiliate has gained a foothold in Afghanistan as the U.S. squeezes the extremists in Syria and Iraq. Trump’s definition of a win notably did not include defeating the Taliban, the group whose harboring of al-Qaida led the U.S. to war in Afghanistan in the days after the 9/11 attacks. 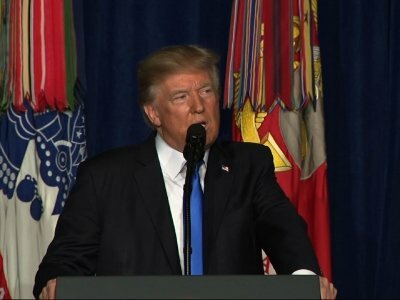 Like President Barack Obama before him, Trump conceded that any solution that brings peace to Afghanistan may well involve the Taliban’s participation. Talk of future Taliban reconciliation was one of several echoes of Obama woven into Trump’s plan. Like Trump, Obama insisted near the start of his presidency that the “days of providing a blank check are over,” urged a regional approach and said U.S. assistance would be based on performance. Still, Trump was intent on differentiating his approach from his predecessors — at least in rhetoric. He emphasized there would be no timelines, no hamstringing of the military and no divorcing of Afghanistan from the region’s broader problems. One step being considered to further squeeze Pakistan is to cut foreign aid programs unless Islamabad clamps down on the Taliban and an associated group known as the Haqqani network, senior administration officials told reporters ahead of Trump’s speech. Using civilian and military aid as a pressure lever with the Pakistanis has been tried for years. Trump’s speech concluded a months-long internal debate within his administration over whether to pull back from the Afghanistan conflict, as he and a few advisers were inclined to do, or to embroil the U.S. further in a war that has eluded American solutions for the past 16 years. Several times, officials predicted he was nearing a decision to adopt his commanders’ recommendations, only to see the final judgment delayed. And while Trump has pledged to put “America First,” keeping U.S. interests above any others, his national security advisers have warned that the Afghan forces are still far too weak to succeed without help. Even now, Afghan’s government controls just half the country. “Tonight, the president said he knew what he was getting into and had a plan to go forward. Clearly, he did not,” said Pelosi, D-Calif.
At its peak, the U.S. had roughly 100,000 in Afghanistan, under the Obama administration in 2010-2011. The residual forces have been focused on advising and training Afghan forces and on counterterror operations — missions that aren’t expected to dramatically change under Trump’s plan. Burns reported from Amman, Jordan. Associated Press writers Kathy Gannon in Islamabad and Jill Colvin and Ken Thomas in Washington contributed.